The theme of this year’s NAIDOC Week was “Because of Her, We Can!”, a beautiful affirmation of the leadership, energy and difference Aboriginal and Torres Islander women have made and do make every day in the lives of their families, schools, communities and the nation. Inspired by that theme, here are just a few of the amazing women of the union movement, the education community and the QTU. Kara Keys is the ACTU’s National Campaign Coordinator responsible for driving engagement with the ACTU’s National Change the Rules campaign (https://changetherules.org.au/). The national union movement knows that 30 years of trickle-down economics has failed to provide secure jobs or fair pay rises, and that the rules must be changed so jobs with basic security and rights can be restored. 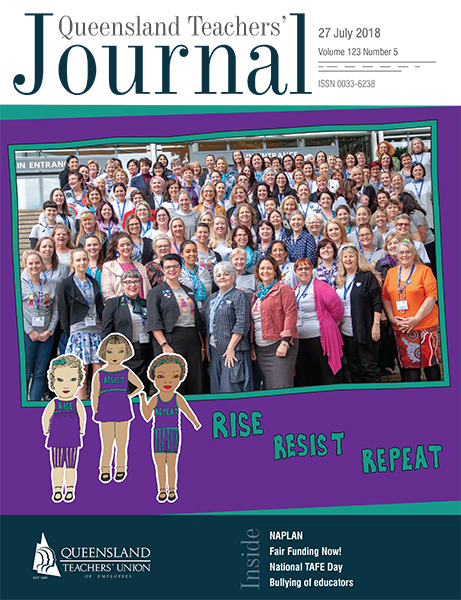 Kara is working with unionists and community members from across the country to get that message out there, including providing the keynote address on Change the Rules at the recent QTU Women’s Conference. Kara, who is a descendent of the Yiman and Gangulu peoples of central Queensland, has a long history of unionism. Prior to joining the ACTU in 2013, initially as the Indigenous Officer, she worked at the Queensland Council Unions as the Indigenous Industrial Officer, for Unions NT as the OHS Officer and with the Australia Education Union as the Federal Aboriginal Officer. Aunty Penny Taylor became the first Aboriginal person to be elected to the QTU Executive, by a rank and file vote at the QTU’s State Council in 2013. Aunty Penny has been active with her colleagues in the fair funding campaign, often hosting the Gonski stall at the Jimboomba markets. She undertakes a wide range of activities and representative positions within the QTU, including State Council Representative for the Gugingin Branch. In fact, it was Aunty Penny, along with branch members and community elders, who worked to have the QTU Greenbank/Jimboomba branch’s name changed to Gugingin, in recognition of the Gugingin family group (one of the eight groups within the Yugambeh people) who lived and live in the geographical area that the branch covers. Aunty Penny is also an active member of the QTU’s Gandu Jarjum Committee (the Union’s Aboriginal and Torres Strait Islander committee) and represents the QTU on the AEU Yalukit Yulendj Committee (the national Aboriginal and Torres Strait Islander committee). Aunty Penny presently holds the QTU Aboriginal and Torres Strait Islander member position on the QTU Executive. Cairns QTU activist Margaret Malezer was the first person to fill what was in 2016 the new position of Aboriginal and/or Torres Strait Islander representative on the QTU’s Executive. The 2015 QTU Conference made the historic decision to expand the Executive to recognise the unique experiences and perspectives of our Aboriginal and Torres Strait Islander members. At the same time, Aunty Penny Taylor, a Wiradjuri woman, was re-elected to Executive. The introduction of an identified position ensures that there will always be at least one Aboriginal and/ or Torres Strait Islander voice on Executive. Margaret’s election recognised her history of activism with the QTU, and she continues to be a Senior Area Representative, a member of Peninsula Area Council, State Council and Gandu Jarjum, the QTU’s committee for Aboriginal and Torres Strait Islander members. She also an activist for the ACTU’s First Nations Workers’ Alliance CDP campaign. Margaret is of the Gubbi Gubbi and Kamilaroi peoples and was born and raised in Brisbane. She works in the Far North Region, originally as an early childhood educator.